I first played Chopper on the Mac before the iPhone had even been released and though it was simple in terms of graphics, the side-scrolling shooter was immensely fun to play. When the iPhone was released, David Frampton, the one-man company behind the game, was there on day one of the App Store launch with Chopper for the iPhone. It was a straightforward port of the Mac version but was even more fun to play, due to the accelerometer and touch-based controls. With the release of Chopper 2 as a universal application for the iPad, iPhone and iPod touch, Majic Jungle Software has taken the Chopper series to a whole new level. The game boasts three-dimensional environments, more realistic physics and all-new levels, while retaining the same side-scrolling gameplay. And there are some surprise additions too, which I will get to later. In Chopper 2, you are a helicopter pilot and have to complete the missions that are given to you across 36 levels spread over 12 locations (and four levels of difficulty). Upon launching the game, you select one of the two levels available to you initially. The first thing you’ll notice when you kick-off the first level is the fluidity with which the chopper flies, swerves and lands in the game. It goes faster the lower you fly, but you also run the risk of crashing or getting struck by the enemy if you’re too close to the ground. Some levels also have birds that you have to avoid running into. 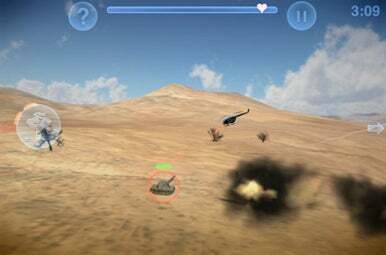 Your chopper is equipped with bombs, missiles, and bullets, all of which you can use to maul the enemy troops—which consist of soldiers, tanks, honing missiles, and helicopters, to name just a few. There are hostages that you have to rescue, locations that you have to reach within a certain amount of time, and targets you have to destroy. A health bar at the top of the screen indicates how much of a beating you have taken and, sometimes, a single well-aimed missile hit at close range is all it takes to deplete that bar from full to almost nothing. Fortunately, there are landing pads in some of the levels which allow you to take a break, regain your health, and reload all weapons. Though bullets are unlimited for your guns, you can carry a maximum of eight bombs and missiles at a time. The physics, graphics, and sounds in the game are very good. This is by no means the best looking or the most realistic game on the App Store, but it does not need to be. A couple of neat touches that I particularly liked were the ability to knock down enemies with the tail wing of your chopper (though it usually only happens as an unintended, but always welcome, consequence) and the realistic manner in which enemy soldiers flail about before falling down when shot. Copper 2 really shines when it comes to controls and has the widest assortment of controlling options among all the games I’ve tested so far for iOS. You can choose to use the accelerometer for flying the chopper and on-screen buttons for firing, which is the default, or have a virtual D-pad for controlling the flight of the chopper. The default settings work best on the iPhone but I switched to the latter option on the iPad because its size makes it a bit hard to physically maneuver. If you happen to own both an iPad and an iPhone (or iPod touch), you can utilize the really fancy feature that allows you to play the game on your iPad and control it remotely using the iPhone via Bluetooth. If you have a large display, you can hook it up to the iPad through a VGA connector and view the game on the large screen while you use the iPhone as a controller. Though it is an immensely cool way to play the game, I found it actually much harder to control this way. While it certainly is satisfying to be able to look at it on a huge display, I could never quite get used to the virtual controls on the iPhone’s display and would constantly be pressing buttons unintentionally. This is, of course, no fault of the developer and may in fact be a problem unique to me. I’ve read several other people’s opinions that the remote control feature is terrific and that they had no trouble controlling the helicopter using the virtual controls on the iPhone’s screen and the device’s accelerometer. Chopper 2 is a fun and satisfying way to pass the time. The game looks polished, the controls are well implemented, the physics are above par, and the gameplay is addictive. It has cemented its place among the top echelons of games on the App Store, and you cannot go wrong buying it.